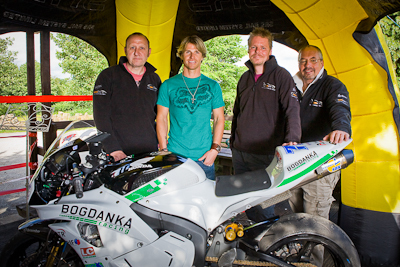 MOTO GP racer and twice British Superbike Champion James Ellison paid a visit to Derbyshire as part of a recent promotion campaign. Sportsshots were invited to cover the event that gave fans a chance to get up close and personal with James and grab a photo and autograph session with the rider. James started ridding at the age of 15, going on to compete in the European Superstock series in 1999, winning the title in 2000 and 2001. Ellison switched to the British Superbike Chapionship in 2004 riding a Yamaha YZF-R1 for the privateer Jentin team. He finished 11th overall, and won the privateer cup for independent riders. In 2005 he went to Moto GP and in 2006 he made history as the first rider to switch bikes mid-race, onto a bike with wet weather tyres. James and his Honda appeared at the White Hart at Moorwood Moor and said in his recent blog that this would most likely be one of the only public appearances he would make this year. The event was held as part of a promotion for SRS Rail Systems.